I was hoping to post these in time for Pancake Day on Tuesday but it didn't happen. And that may be fine because, to be candid, I didn't grow up eating pancakes but I ate a lot of crêpes. (In Serbian/Croatian, they're called palacinke). 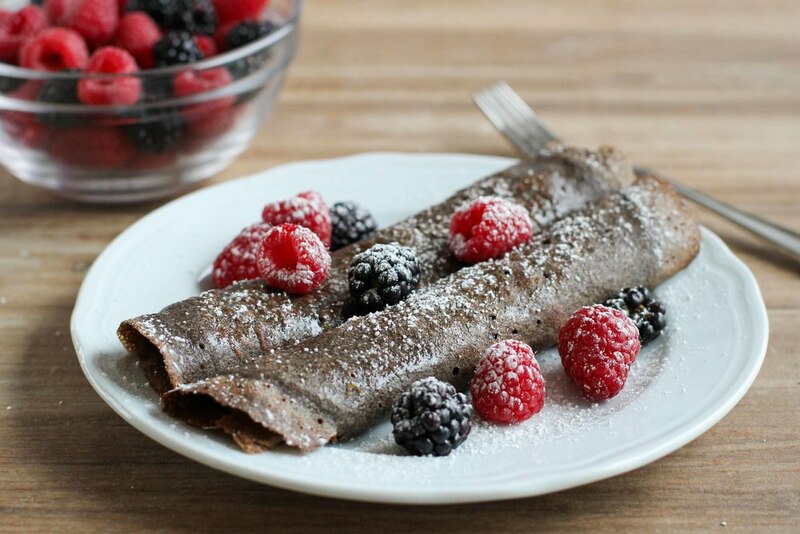 Spread with plum or rosehip jam (or even Nutella), rolled up into pretty spirals, and -- this next part is a little tacky and very European -- dusted with powdered sugar, crêpes could stand in for breakfast, dessert, or an evening snack. I mean, I don't even like powdered sugar. But the soft texture of the sweet crêpe, the light layer of jam or chocolate, and a fine dusting of delicate sugar are such fundamental elements of the thing I ate as a kid that, to me, powdered sugar is de rigueur when serving crêpes. Plus, the effect of a crêpe's lacy edge under a coating of white powder is achingly pretty. I think. I tried to split the difference here by picking up an organic/less-processed powdered sugar but, in the end, the texture was odd and it melted right away. (Which made for some quick photography work in between powdered sugar applications and futile attempts to keep blueberry preserves and sugar off my camera equipment. Do yourself a favor and use the real thing.). The crêpes of my childhood were white milk/white flour/white sugar situations -- delicious but no longer acceptable, I think. And, so, I substituted almond milk for cow's milk and used buckwheat flour. Accordingly, these beauties are dairy-free and gluten-free. Of course, if you'd like to use dairy and all-purpose flour, you can still use this recipe. (See the notes below for modification tips). The actual making of a crêpe requires a little practice but once you master it, the skill never leaves you. Expect to lose the first two, as well as the last one -- it happens to everyone. A perfect crêpe requires the right consistency of batter, the right oil, the right temperature, and the right skillet. This is what I've learned over the years: the batter needs to be slightly thicker than cream; annoyingly, nonstick skillets are best but if you have a dedicated crêpe pan, use that; the temperature should be just below medium, somewhere in the medium-low area, but you'll have to make adjustments as you work (I have a gas burner and I find myself drifting from low to medium and back as the crêpes cook); and I get the best results with avocado oil but any other flavorless oil will work. I won't lie, it's a little fussy, but once you get into a good groove, you can pretty much flip a whole bunch of crêpes in about ten minutes. And, by the way, the secret for flavorful crêpes? I probably stole this from my mom but add a pinch of citrus zest to the batter. It makes a real difference. Whisk the milk, eggs, water, sugar, and vanilla extract together in a medium-sized bowl. Add the buckwheat flour and whisk until no clumps remain. Whisk in avocado oil, a pinch of sea salt, and orange zest. Cover with plastic wrap and allow the batter to rest in the fridge for at least an hour but preferably overnight. When ready to cook, stir the batter again and add more almond milk to thin the batter to the consistency of heavy cream. You will need to thin it out again as you're cooking the crêpes. In general, I end up adding another cup of milk as I'm cooking. Heat a nonstick skillet or crêpe pan over medium heat. Add a few drops of avocado oil to lightly coat the bottom (go easy on the oil). With a soup ladle, ladle in about 1/4 to 1/3 cup of batter (depending on the size of your skillet). The trick is to move the skillet off the heat, ladle the batter into the center of the pan, and then gently tilt the pan in the air, allowing the batter to swirl and coat the bottom evenly in a thin coating. Cook on the first side for about 30 seconds to a minute or until small bubbles appear and a lacy edge forms around the edge of the crêpe. With a heat-proof spatula, gently pry the edges loose and flip the crêpes over with your fingers. (Don't worry -- it's not that hot. If you're concerned, a fish spatula works well.). Cook on the second side for about 20 seconds or so. Slide onto a plate and cover with foil while you cook the remaining crêpes. Maintain the temperature at medium-low and add a few drops of oil in between each crêpe. To serve, spread with jam (or Nutella! ), roll up into a spiral, and top with powdered sugar and fresh berries. Make ahead: The crêpes can be prepared 3 days ahead. Store covered in the fridge. To reheat, warm each crêpe in a dry skillet over medium heat, a few seconds per side. Note: For savory crêpes, omit vanilla and sugar. If using regular all-purpose flour, reduce the milk to 3/4 cup. Cover the prepared crêpes so that they stay moist as they cool. Store buckwheat flour in the freezer.